The second weekend of November can only mean one thing. Festivities and lots of holiday cheer are just around the corner. I'm not sure I'm ready for all of it but it's coming. 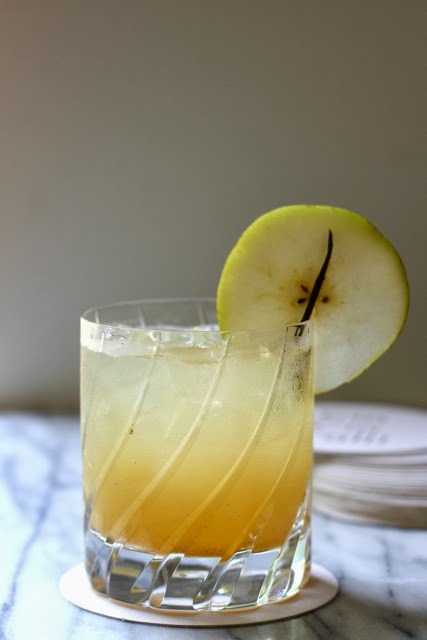 So to help get in the spirit, I've got a line-up of fun holiday libations to share over the coming weeks but first, this pear and honey cocktail. Several months ago, I pinned something similar which inspired my own version. Some wild honey flavored vodka was all I needed to make this finally happen and wow, am I glad it happened. Mix vodka and pear nectar over ice. Then add vanilla seeds and ginger ale and stir. Garnish with a fresh pear slice and leftover vanilla pod. Cheers! This sounds pretty amazing for the weekend. Happy Friday. holy moly! this looks unreal. i want to try this weekend!